An expense here, a new credit card there. Repeat the process a few times and the next thing you know you have a stack of bills to pay every month and not enough money to pay them all. Having too many bills is a situation that's ripe for financial ruin. If you don’t change something soon, your money troubles will only get worse. 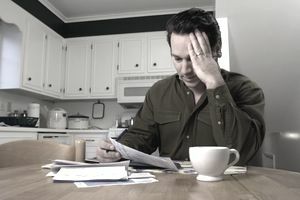 Exhausting your income each month is one of the spending habits that can lead to debt, particularly if you're using your credit cards to fill in gaps. Eliminating some of those bills is often the best solution. Start by making a list of all your bills. Don’t try to do it all by memory; you probably won't remember all the bills you pay each month. Use your monthly statements to help start the list. If you’ve signed up for paperless billing, print the statements from the internet. Review your checking account to see which bills you’re paying every month to fill in any bills you may have missed. The list might get overwhelming, but don’t worry. This is a necessary step in simplifying and de-stressing your financial life. The list, while potentially time-consuming, will be instrumental in helping you get your bills under control. You may be paying for things you didn’t realize you were paying for, e.g. subscriptions you forgot to cancel or services you no longer use. Are there services you can consolidate? For example, can you get your homeowner’s, auto, and other insurances through the same company? Perhaps you can bundle your cable, internet, and home phone? (Or get rid of the home phone all together, especially if everyone in the house has a cell phone.) If everyone in the house is on a different cell plan – and one person is making the payments – consider moving to a family plan. You may even save money by combining plans. You may be able to consolidate multiple credit card balances by transferring balances to just one credit card. You just need to have a credit limit large enough to accommodate all your balances. A balance transfer credit card with a promotional interest rate will allow you to condense your expenses and save money on interest. Are there bills you can pay off? You may have some small outstanding bills that you can just pay off and eliminate them complete. It may require a short-term sacrifice that’s critical for your long-term sanity. Are there some bills you can get rid of? Consider all your recurring monthly services and memberships. There may be some of these you can cut to simplify your bills and to save money, especially if you don’t use them. Some ideas of what you can get rid of: cable television, satellite radio, Premium online radio (e.g. Pandora or Spotify), monthly box clubs, magazine subscriptions, etc. The more bills you can eliminate, the more room you'll have in your budget. If you have past due bills and you can’t get caught up immediately, contact the biller to discuss your repayment process. Discussing financial difficulty is not an easy process, but you may be surprised to learn that many companies are willing to work with you. For example, you may be able to pay your past due balance over several months or have your late fees waived. Many creditors and lenders have hardship programs specifically for customers who hare facing financial trouble. You may not have the ability to command more money from your current job, but consider getting a part-time job to help pay your bills. You can also make extra money from a hobby, by providing a service, selling things, or starting a business. This is perhaps the most important step of all. When it’s time to get rid of expenses, avoid saying “I can’t get rid of ___________ because <insert excuse here>.” If you have too many bills, you have to let some of them go. It’s that simple. Rationalizing why you should keep unnecessary services will not help. You have to make the hard decisions and tough sacrifices if you want your financial situation to get better. Saying you "can’t" do something places you in a position of powerlessness and leaves you unable to do anything. But, when you change your mindset, you empower yourself to make the changes necessary to get in a better financial position. When you say "I can" rather than "I can't," you stop making excuses and start coming up with alternatives. If you’re having financial troubles, the worst thing you can do is sit idly. Your finances won’t correct themselves. Instead, it’s up to you to take control and turn your financial situation around.